Getting ready for our first camping trip. It's only over night, but I just wanted to go somewhere. I found a small leak at the hose between the water pump and distribution manifold. I tightened the clamps and the leak stopped. As you can see the hose is bulging quite a bit. It is supposed to have a working pressure of 200 PSI. and my pump is supposed to be 75 PSI. Although, I haven't checked it, it's no where near 200. Should I be concerned? Yikes! She's going to blow!! Looks like the same hose that we have in our system and it doesn't look like that !! Are you sure about the pressure ? Either the pressure is way high or that hose is weak. Accident waiting to happen. Change it and quick! Yep! I would change this ASAP! Famous Last words,, " I'll Fix It When I Get Back"
In the time it took to post and read the replies, you could change the hose! Even a small piece of garden hose you have lying around would work for now. Any hardware, farm supply, big box home store along the way will have hose to fix that. That is a very easy fix. Before the camping trip might be best. During the camping trip...not so much. Good advice on fixing it now! That is such a easy fix I wouldn't even think of taking off without replacing the hose. I guess I was thinking along the lines of has anyone else had this problem, and what can I use so that it doesn't happen again. The pump manufacturer says to use a flexible connection between both the inlet and outlet and any hard line. The pump comes with hose barb fittings. I have no idea how hot it's been, how ever hot it's been in the basement I wouldn't think much over 150 in Indiana. This and any 1/2 inch hose I have been able to find at any " hardware, farm supply, big box home store" are rated for 200 psi at 70 degrees. Agreed, it's an easy fix, I just don't want to have to do it again. That reinforced tubing is some pretty tough stuff. I think it's just a fluke that it is failing, a defective hose, high temps, high pressure, whatever. I would just replace it with the same stuff and not worry too much about it. I had a similar issue with that type of hose. It is cold water only, hot water will weaken it. My issue was it was a little ways back on the cold water feed to the hot water heater. 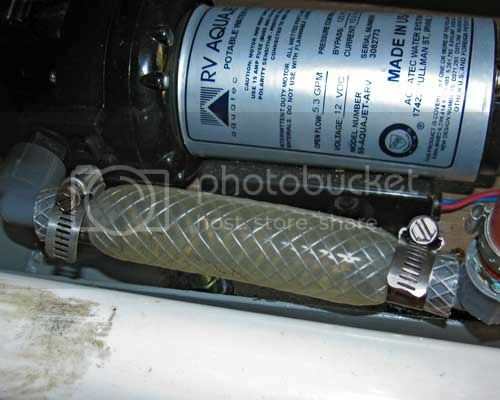 When at rest the heat would migrate back causing the hose to weaken and expand. It eventually blew off..